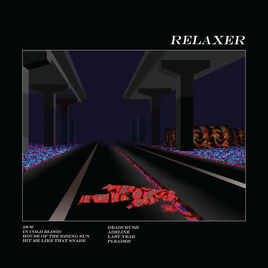 Albums of 2017: 5) Alt-J Relaxer – music waffle. There’s a whole set of disparate threads running through this album. In parts it is gorgeously rich and luscious, with a very British folk based warmth. Then there’s the experimental range of sounds that is uniquely Alt-J. Finally there’s a bit of essential oddness that makes it somewhat inexplicable at times. There are only nine tracks on the album, one of them being a repeat of In Cold Blood and the other a cover of House of the Rising Sun, which falls short of good value if we are being truthful. Yet some of the tracks are so striking that you can just about forgive them, and the singles are backed up with classy videos of Hollywood proportions. My favourite is Deadcrush – not many songs start with a line like, “Extraordinarily pretty teeth…” Deep beneath the Earth rotating orbs generate dancing orange versions of the band’s deadcrushes – Lee Miller and Anne Boleyn. Anne cavorts about in front of a stained glass window of the Tudor Rose to the words, “Henry Tudor left you lifeless.” As the orbs run out of momentum and keel over, so do the dancers. Opening single 3WW is a brave song indeed because the intro goes on for a hellishly long minute and a half, which is likely to send the average radio station into a seizure. But you can’t rush the sonorous mood. Then a very naked vocal which would be so easy to rush, “There was a wayward lad, stepped out one morning, the ground to be his bed, the sky his awning.” The three worn words (I love you) are spoken in his own language – not the traditional desperation of perfect love but the slightly tired and unsuccessful way a young “over-loved” man goes about it. There’s another exquisite artistic video shot in black and white involving the transportation of dead bodies in Mexico – very spiritual and moving. In Cold Blood starts with a binary code of 0s and 1s – 01110011 is binary for the letter ‘s’ but it’s not clear if this has some significance. Lyrically, a summertime pool party ends in death and on the video Iggy Pop’s drawl introduces the woodmouse ( I did say there was oddness in there.) A striking track with organ toned keyboards and a sway of brass to back up the melodies and the la las. Pleader is an exquisite pastoral symphony inspired by the book How Green Is My Valley by Richard Llewellyn. Recorded in Ely Cathedral, it’s got all the spiritual swell of a choral congregation and the video has epic Earth moving visuals as we see a family from a Welsh mining village get torn apart. Alt-J have nailed a very English quirk-folk sound that is hard to resist. I’d just like a little more of their brilliance in the next album. Next Albums of 2017: 4) Royal Blood – How Did We Get So Dark?